Grosse Pointe Art Assoc. 79th Members Show. The opening is today from 2-4pm at the War Memorial. Hope to see you there, although I’ll be late, coming from my daughters gymnastics meet. Happy Sunday, stay dry. Unexpected Expedition hanging in the 79th GPAA members show at the War Memorial in Grosse Pointe. Come to the Grosse Pointe War Memorial. The 79th GPAA Members Show. 2-4pm. I’m lucky to have two pieces in this show. Thank you GPAA. Their theme for the evening: Digital technology is as much a part of contemporary art as it is a part of our daily lives. It affects the way we see and interact with the world, as well as how artists respond to it. The influence is so broad that we are now in a post analogue art world. Not to say that painting, sculpture, and photography are dead; on the contrary, they are augmented, just like our reality. Technology interacts with the arts in so many ways. Artists use digital components in research, creation, dispersion, cooperation and collaboration, just to name a few. Digital technologies in the arts have shrunken our physical world while expanding our conceptual capabilities, creating new conversations and expressions about how we view and create art. Digital technology is as much a part of contemporary art as it is a part of our daily lives. It affects the way we see and interact with the world, as well as how artists respond to it. The influence is so broad that we are now in a post analogue art world. Not to say that painting, sculpture, and photography are dead; on the contrary, they are augmented, just like our reality. Technology interacts with the arts in so many ways. Artists use digital components in research, creation, dispersion, cooperation and collaboration, just to name a few. Digital technologies in the arts have shrunken our physical world while expanding our conceptual capabilities, creating new conversations and expressions about how we view and create art. The presentation and discussion will take place Thursday, May 11, in the Art Studio, at The War Memorial, Grosse Pointe, MI. Please let me know if you are interested in participating in this discussion. “Just Bluffing,” and “Unexpected Expedition” have been accepted into the Grosse Pointe Art Association’s members show. If you’d like to see these paintings in person, along with several works by other talented humans, here are the details. 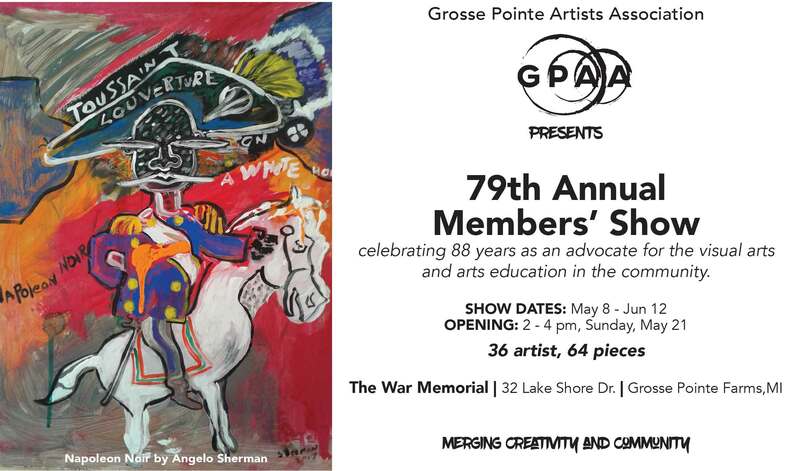 The show is located at the War Memorial in Grosse Pointe, MI. The exhibition dates are from May 8 – June 12. The reception is from 2 – 4 pm, Sunday, May 21. I will be late to the reception because my daughters have a gymnastics meet. So if you’d like to chat, I’ll be there around three.